Atletico Madrid chief coach Diego Simeone has extended his contract for a further two seasons, until 2020, the capital football club announced on Tuesday. 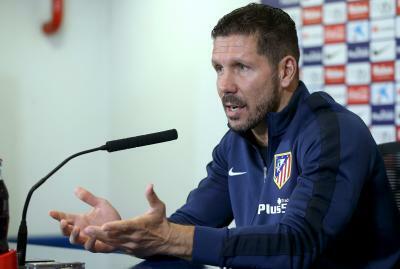 Simeone, who himself triumphed as a player for Atletico during the 90s, has been in charge of the Madrid club since December 2011, reports Efe. “Our manager signed the new contract that ties him to Atletico de Madrid for two more seasons, until June 30, 2020,” the Spanish club confirmed in a statement on its official website. Simeone has won five titles with Atletico since his arrival, including the UEFA Europa League and the European Super Cup in 2012. He also claimed the Copa del Rey title in 2013 after beating Real Madrid at the Santiago Bernabeu. Simeone snatched the 10th La Liga title for Atletico in the 2013/2014 season, the same year he won the Spanish Super Cup. Last season, the Argentine coach managed to qualify for the UEFA Champions League group stage for the fifth consecutive time, in addition to reaching two finals of the Champions League in 2014 and 2016. Throughout his coaching career at Atletico, Simeone won 136 out of 214 La Liga matches; 20 of 37 Copa del Rey clashes and one out of four Spanish Super Cup duels. At the European level, the Argentine coach had 28 victories out of 48 Champions League games; 14 out of 17 European League matches and one out of one in the European Super Cup.